Continuing the minimalist, sporty tradition of our famous Flyscreen®, the new Mohawk™ features a taller and wider size with a special "V" profile for added wind management. 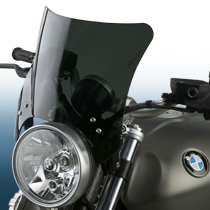 As with our Flyscreen, the versatile Mohawk is adaptable to many motorcycles. Headlight Mount Mohawk Windshields (N2844-001, N2844-002) may fit older (1955 onwards) Airheads with standard headlight mount ears on the upper fork tubes. Call for more information. 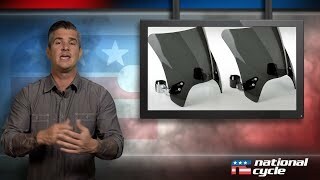 National Cycle Introduces the NEW Mohawk™ Windshield! 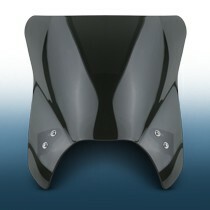 The Mohawk™ has a sporty, minimalist design yet still offers good wind protection. 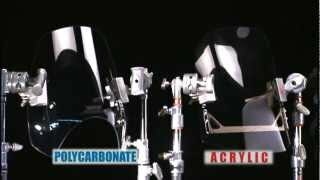 The clean appearance is accented with your choice of chrome or black mounting hardware. Our Linking Arm Mounting Hardware with countersunk screws offers a truly custom fit for bikes with exposed fork tubes. 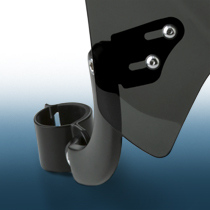 Our patented slotted windshield brackets are engineered for fork width adjustment from 8.5"-11.0" (21.6-28.0cm) spacing. 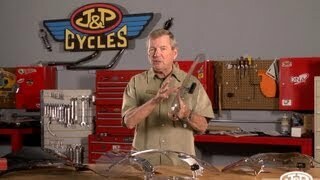 There are few bikes that this windshield cannot fit. Also available is our Headlight Mount Hardware that is the perfect setup for many standard bikes and older models with traditional headlight mounting. The Mohawk is a lot of quality in a very small package. The Mohawk™ is manufactured form 4.5mm thick polycarbonate with FMR hardcoating. 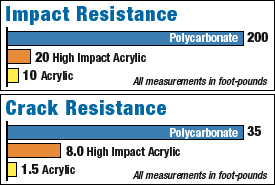 This material offers unbeatable impact resistance and excellent scratch resistance compared with acrylic or HIA windscreen material. Our state-of-the-art manufacturing produces smooth radius edges; superb forming, and sharp optical quality. The Mohawk is covered by our 3-Year Warranty against breakage. Windshield material is 4.5mm thick Dark Tint polycarbonate with FMR hardcoating for unbeatable impact resistance and excellent scratch resistance, and is DOT and ABE Approved. 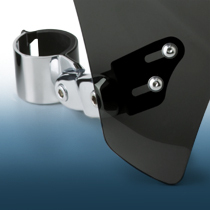 Mounting hardware is available in your choice of quality chrome or black powdercoated finish to match the look of your bike. 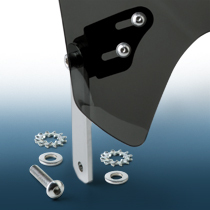 High strength, lightweight, machined steel brackets have the look of custom billet.